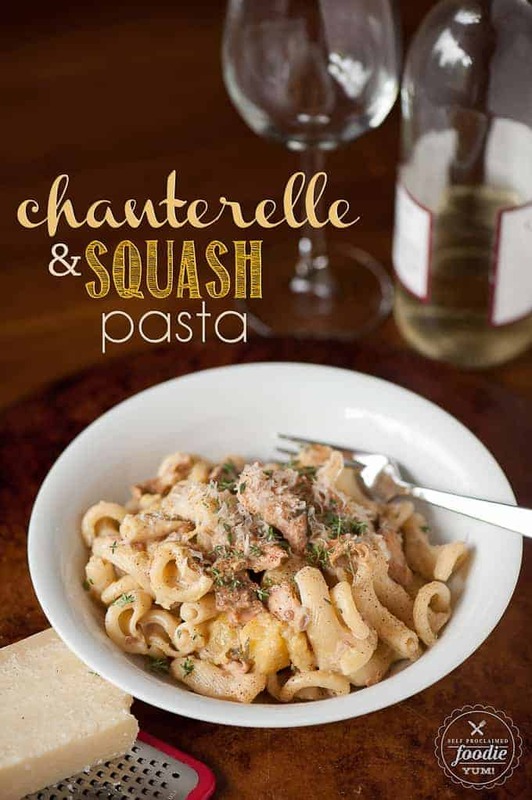 Using the best mushrooms on the planet, this super yummy Chanterelle and Squash Pasta in a light cream sauce topped with parmesan is heaven in a bowl. I love living in Oregon. I’m a California Native and spent a few years living in New Mexico, but I settled in the Pacific Northwest and can’t imagine ever living anywhere else. I love the weather (yes, that includes the rain), the outdoor lifestyles, the love of nature, the supreme love of good food, and the people. I have met so many great friends since I moved here over a decade ago and cherish so many friendships. I stopped by the house of a friend last week to pick up some gift cards I had purchased through her son’s school fundraiser, and she gave me well over a pound of freshly foraged chanterelle mushrooms. I was downright giddy. These babies go for $20 per pound in the store. And I hate to admit it, but I kinda think they’re worth it… even at that price. My friend and her husband took their two little ones out to the Tillamook National Forrest and hunted down a ton of amazing chanterelle mushrooms. They were gracious enough to share their bounty with me. Now that’s good people. 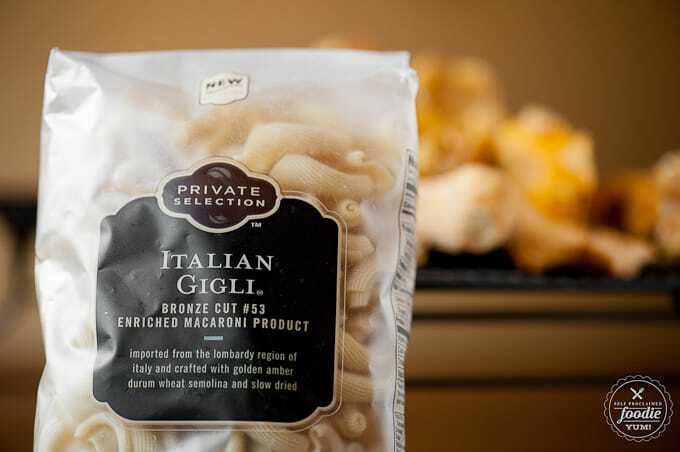 I just so happened to have this Gigli pasta in the pantry. Not Gigli like that horrible Ben Affleck and Jennifer Lopez movie… or maybe that’s how they came up with the name. Who knows. Anyway, when I find a cool pasta at the store, I buy it and save it for that special occasion when a friend gives me a ton of the best fungus on the planet. You can use any old pasta, really, but I like to get fancy sometimes. I just so happened to have a carnival squash that I had already roasted a bit in the oven. Mushrooms and winter squash go great together. 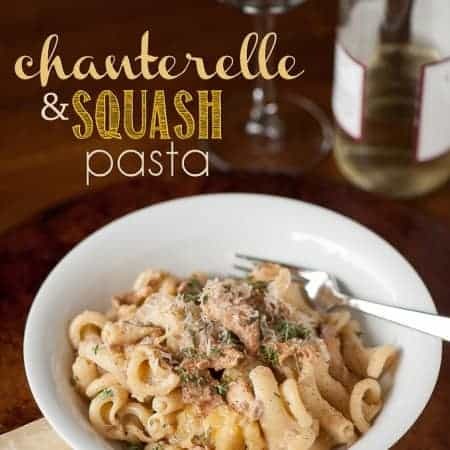 You can totally use any other kind of winter squash like the ever popular butternut, but as always, I cooked with what I had on hand. And, of course, you can’t have squash without sage. Its like wine and chocolate – they’re just meant to be paired together. 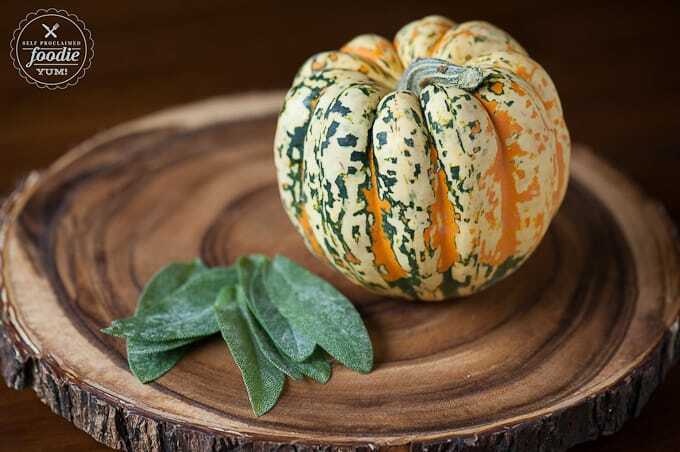 I’ve made a frittata with this kind of squash with some sage and that, too, was mighty tasty. This pasta was fantastic. When I went to eat it the next day, I actually took a huge handful of fresh spinach and threw it in the bowl, topped it with a big scoop of pasta, and microwaved it (I usually hate leftover pasta but this was excellent… and I hate cooking in the microwave but I was in a hurry). Anyway, the spinach wilted from the heat of the pasta and it was wonderful. I also took some of the pasta to a pumpkin dinner party because, although we were supposed to bring a savory dish made with pumpkin, this over committed foodie ran out of time (go figure) and I had to cheat and convince people that the squash was close enough to the pumpkin. Either way, they loved it! You will too. Ahead of time, roast whole squash in 400 degree F oven until slightly tender and easily pierced with a fork, about 30 minutes. Remove from oven and allow to cool. Remove skin, stem and seeds. 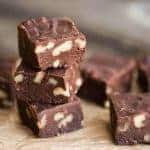 Chop flesh into bite sized chunks. Set aside. Boil large pot of salted water and cook pasta al dente. Set aside. In large heavy bottom saute pan, heat 1 tablespoon butter with 1 tablespoon olive oil over medium heat. Cook shallot until slightly brown and tender, about 5 minutes. Add garlic and sage, cook for another minute or two. Add white wine and deglaze the pan, scraping bottom. 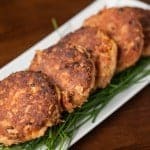 Allow to cook for a few minutes. Add mushrooms and squash. Add additional tablespoon of butter. Stir to combine, then allow to cook until mushrooms are tender, about 5-10 minutes. Remove from heat. 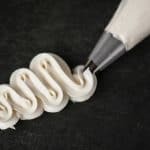 Stir in heavy whipping cream. Toss in pasta to coat. Add salt and pepper to taste. 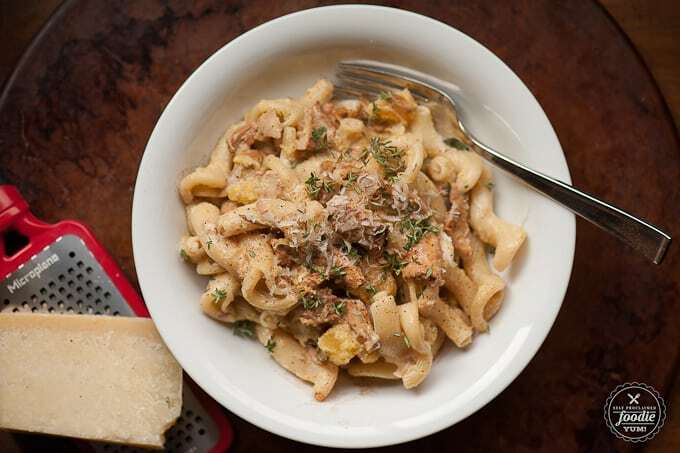 Serve immediately topped with parmesan and a dash of nutmeg. I can’t afford chanterelles even if I find some. 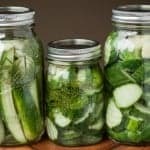 Can you make this with mushrooms that are cheaper and readily available? Sure can! 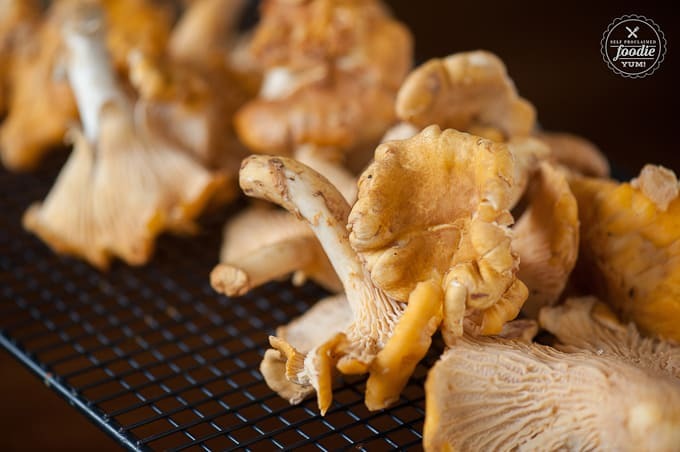 I live in the Pacific Northwest so chanterelles are free when they’re in season (I know of the perfect hunting spot) but can totally understand that’s not the case for everyone. Any kind of mushroom would work and I would think baby portabellas would be delicious!